If you live in Blacksburg VT Alerts can be a useful source of information during the school year. They include alerts in the event of inclement weather or some sort of situation on campus. These events can impact more than just the campus and at minimum can cause traffic and other concerns at odd hours. No matter which category you fall into, if you are interested in notifications of town hall events, road closures and other notifications of interest to Blacksburg residence, go here and subscribe to Blacksburg Alerts. You already get VT Alerts to your vt.edu email address. Go here to add other notification methods. 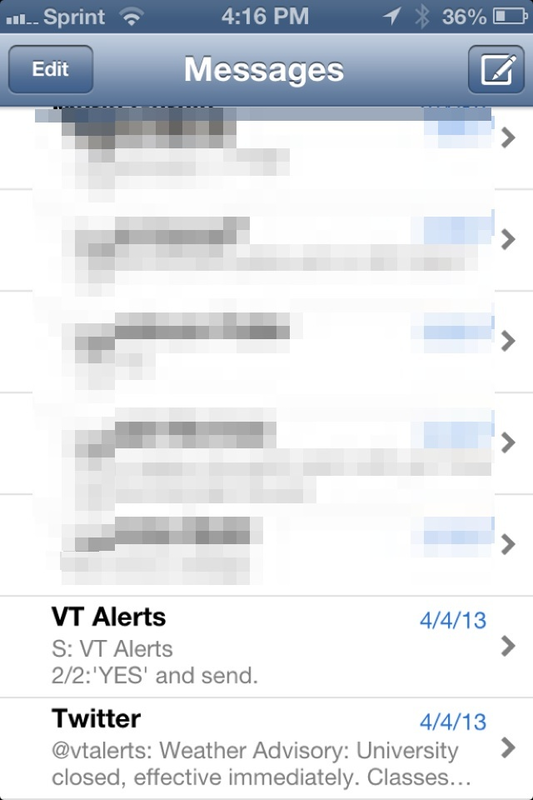 You can subscribe to a variety of alerts (including VT Alerts) from this site. The CRC also has a text alert service for news and other announcements. Subscribe by texting "vtcrc" to 84464. 3. Not in one of these two groups? VT Alerts are also posted to Twitter. If you are a regular Twitter user simply following this account is all you need to do. You can also subscribe to text alerts for that account by texting "ON vtalerts" to 40404 (I assume you are in the US if you are interested in VT Alerts). In my testing over the last few months this method gets me the alert within a minute of the official channels. While I do not offer support for the advice in the post, I am always looking to keep it up to date. Please email me if you have issues with these instructions or if new options become available.